There are any number of ways in which a thief can bypass your door security. A thief can kick your door in, cut the lock or even drill the lock, all ways to gain entrance into your home. The best way to prevent a break-in is to be diligent and use various methods to secure your doors. The best way to do this is to have some sense of how people break into houses. Consider the methods they use and then think about ways you can enforce your doors. Bostons Locksmith offer these ways in which you can better secure your doors at home. The last thing you want is to have your door hidden on a dark porch or covered by trees or shrubbery. Basically, you want your door as visible as possible, this way thieves don’t have the cover they need to break into your home. So grab the chainsaw and cut down any tree branches that are near the door and trim bushes to create a clear path to the door. Good lighting is important as well. Make sure your door is well lit even on the darkest of nights to help prevent a break-in. An alarm that blares when somebody starts messing with your door is a great deterrent. If you are against getting an alarm system, a dog that barks at various outdoor noises will do just fine. Protection from thieves who wish to break into your home begins long before they even get to the door. A security camera can prevent somebody from breaking into your home through a door before it takes place. There are many thieves who will think twice before breaking into a home with security cameras visible. A screen door will never be as secure as a solid wood door or a metal door, but it will make a thief work harder to break int your home. In fact, a screen door could discourage a break in because thieves think it would take to long to break through two doors. Skip the cheap locks you find at Target and Walmart, what you need are proper locks that are secure and strong. Also, door security comes from a deadbolt and not the wimpy lock you have on your door handle. So make sure you have a tough deadbolt on your door. No matter if you have a solid wood door or a metal door, it is only as strong as the hinges that hold it in place. it is very likely that the screw used to hold your hinges in place are far too small. This means you are at risk of having someone kick in your door. If you swap out those short screws with long screws that go all the way into the stud, you will have a much sturdier foundation for your door. 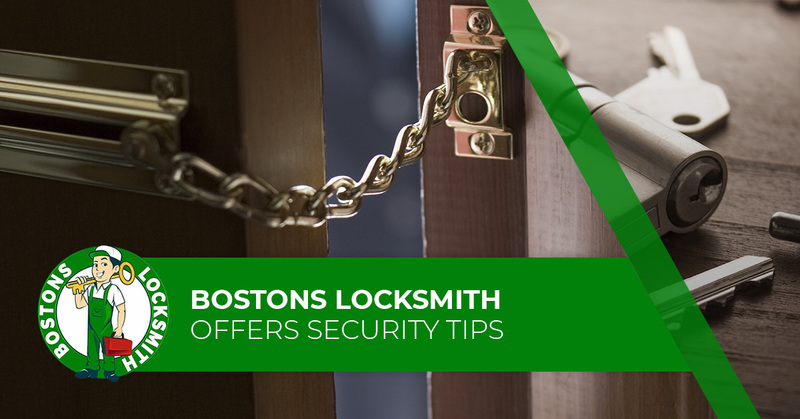 If you have any question about home security, don’t be afraid to call Bostons Locksmith.